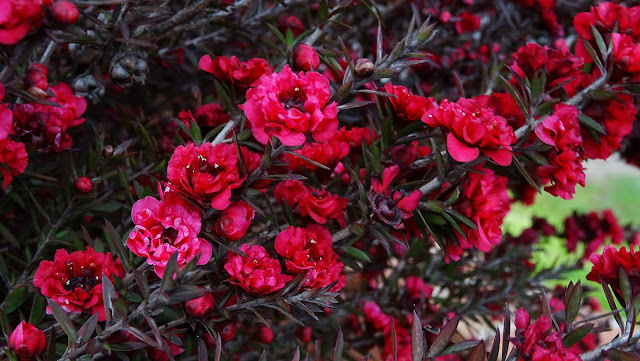 Leptospermum is a genus of flowering trees and shrubs in the family Myrtaceae, which is native to Australia, New Zealand. Called "tea tree" because Captain James Cook in the 18th century brewed a tea from the leaves and gave it to his crew as a scurvy preventative. These are substantial and useful plants all year round; soft and casual looking (never rigid or formal). Most make a display of five-petalled single flowers (somewhat like tiny wild roses) along stems among the small leaves. Petals surround a hard central cone or cup that matures to a woody seed capsule that hangs on for a long time after the petals drop. Flowers are typically white, pink, or red. Shown here is the hybrid 'Burgundy Queen'. Few drought resistant shrubs can rival the colour of 'Burgundy Queen.' Everything about it is majestic and burgundy. Its profuse, fully double flowers are intense dark burgundy, and the fine foliage of this large shrub is also burgundy flushed. It originates from New Zealand where it grows in a wide range of areas from peaty bogs to coastal and montane regions. So, it is surprisingly adaptable, especially to arid sites and soils. Tea tree is a large shrub to small tree that develops an untamed grace when allowed to maintain its naturally irregular form. Bloom time is variable. South of the equator it blooms from Spring through to Summer, but in the southwestern United States it tends to bloom from Autumn to Spring. The double burgundy blooms are small and densely line the branches. Tea tree grows quickly if given full to partial sun and acid to neutral soil with average to good drainage. It will withstand arid coastal and inland conditions but grows more vigorously if well-watered. In highly arid regions, it is best to provide protection from hot afternoon sun. Use tea tree to flesh out mixed borders and dry gardens. It is excellent for erosion control but not in wildfire hazard zones as it is oil-rich and volatile. Allow tea trees to grow naturally. Many a well-intentioned gardener has “tidied" them up with shears or clippers thus spoiling their natural shape while creating more long-term maintenance for these otherwise carefree plants. Join me for Floral Friday Fotos by linking your flower photos below, and please leave a comment once you have done so. Add your own link to the Linky list below and say hello in a comment. Please visit other participants in the meme. Thank you for your loyalty and perseverance in linking up, it is appreciated! Nick, what a spectacular flowering tree. Thanks for sharing. So pretty! I'm familiar with tea tree oil but not the flowers.